Ok, maybe not EVER. But it’s the best bread to come out of my kitchen. 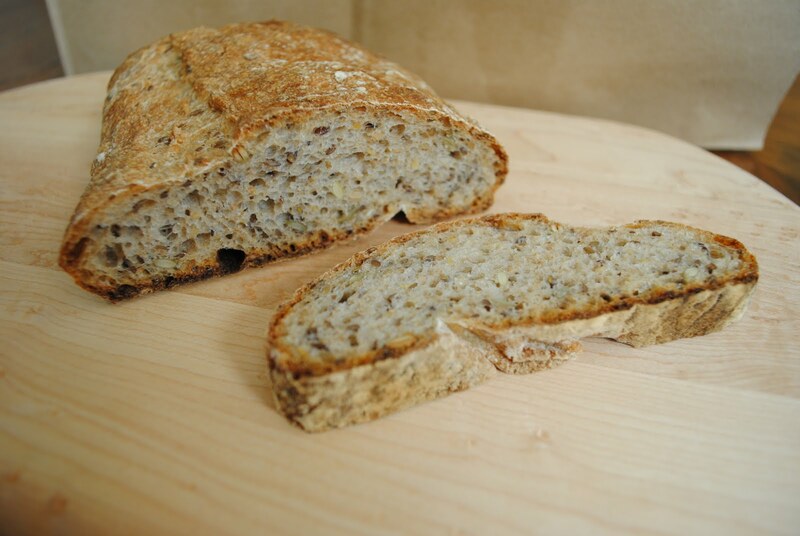 Flecked with nutty flax seeds and whole grains, this bread offers the perfect amount of heartiness, sponginess, and chewiness (I like bread that gives your teeth a workout. I want to hear ripping when I bite). Best of all, unlike most of Reinhart’s recipes, you can complete all the steps in a single day (provided you’ve already got a happy, well-fed sourdough starter in the fridge). The recipe comes from Wild Yeast, a blog I’ve been following for six months or so. 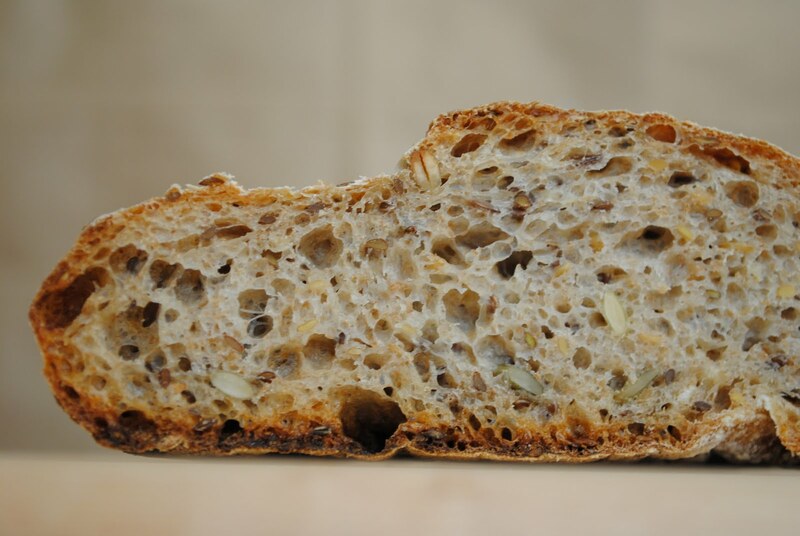 I love this blog because 1. it has great pictures, 2. all the recipes use ONLY sourdough starter, 3. the sourdough starter* she relies on is 100% hydration, which basically means that it’s really easy to maintain. [*A not-so-brief note on sourdough starters: Don’t be scared, they’re friendly and easier than you might think to maintain. (If you don’t already have one, Wild Yeast has an excellent tutorial on how to start one here. You can also order one, like I did, here.) One common myth is that you need to be super careful to feed them weekly. I have gone as long as a month without feeding my starter, which I keep refrigerated. And it’s still going strong. If I leave it for a particularly long time, I will throw most of it out before I bake and start building it up again by adding flour and water, then waiting for it to get really bubbly, then adding more flour and water, and so on. There are some great tips for maintaining your starter here. But enough talk! You want to see the pictures, don’t you? Mmm. 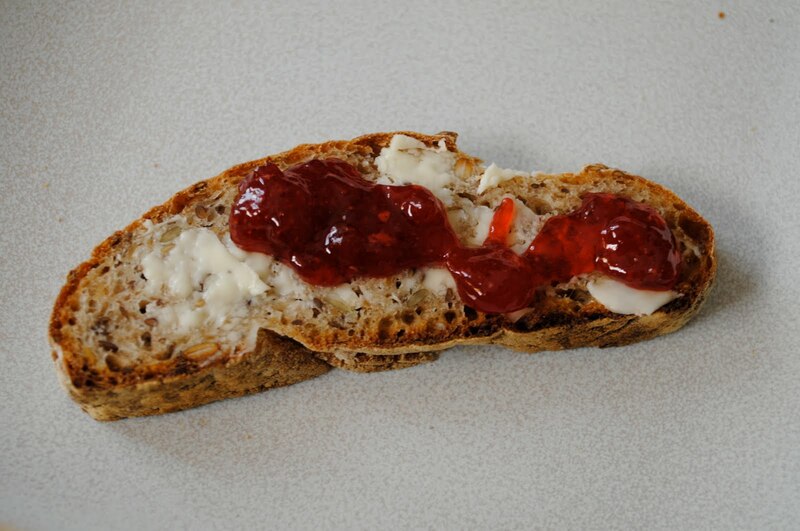 Fresh bread with butter and homemade strawberry jam. Of course, I’m a hopeless perfectionist, so I will tell you what displeases me about this loaf. 1. You can see that it’s rather flat. I didn’t get a nice dome like I wanted. I have a sneaking suspicion that this has something to do with the way I manhandled the loaf while trying to wrestle it into the oven. But how are you supposed to transfer the loaves from the place where they rise to the place where they cook, anyway? I’m thinking parchment paper for next time. 2. I cannot for the life of me get a good “ear.” The ear is the nice crispy flap that you see on the tops of artisan loaves. Here’s how it forms: You slash the loaves before they go in the oven to release gas and the dough flap formed by the slash is supposed to rear up and get really brown and crispy. Mine doesn’t. Maybe because I hacksaw my slashes with a serrated knife? 3. 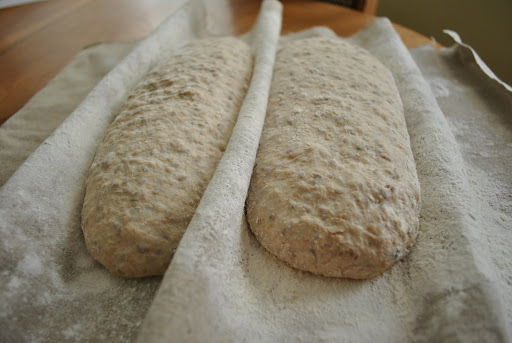 The bottoms of my loaves, this one included, tend to get overly thick and crisp. They are so crisp, you need some serious bicep strength to saw through them. Is my stone too close to the heat? Is that normal? What gives? Questions to ponder I as gobble slice after slice of butter-slathered bread positively dripping with jam.